Dr. Nackman is a licensed clinical psychologist with over 25 years experience working with clients of all ages. She specializes in work with children, adolescents, and their families. Referral issues often include behavioral problems, attentional and impulse difficulties, autistic spectrum disorders and developmental issues, depression and anxiety, peer and relationship difficulties, separation and divorce, regulatory difficulties, and trauma. Adult clients often focus on relationship issues, struggles with depression and anxiety, separation and divorce, parenting concerns, and issues related to the family of origin. 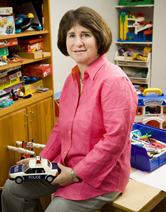 The playroom in Dr. Nackman’s office is specially equipped for working with younger clients, particularly preschoolers and early elementary age students. Parent work is an important component of the work with children. Dr. Nackman provides testing for children, adolescents, and adults with Learning Disabilities, AD/HD, Autistic Spectrum Disorders, and Developmental Delays. Testing may also be completed to evaluate the impact of serious mental health issues. Evaluations are helpful in securing special services from the school, accommodations for standardized testing, Gifted and Talented Placement, and private school admissions. Dr. Nackman was voted as one of Washingtonian Magazine’s top mental health professionals in 2009, in the categories of Troubled Child and Attention Deficit Hyperactivity Disorder. Again in 2012, she was voted as one of Washingtonian Magazine’s best mental health professionals in the DC Metro area in the category of Couples Therapy. © 2010 - 2016 - 2015 Washington Falls Psychotherapy Group All rights reserved.